Faiz is and remains the most outstanding Urdu poet of the second half of the last century. During the last few years of his life, however, he wrote some Punjabi poetry as well which can be found in his last two books namely Shaam-e-Shehryaraan and Mairay Dil Mairay Musaafir. These two books actually contain the poetry he wrote during the 1970s and early 1980s, till he died in 1984 in Lahore. After General Zia removed the government of Z A Bhutto in a midnight coup in 1977, Faiz went into exile and remained abroad till 1983. It was only a year before his death that he returned to Pakistan. When ZAB came out with a revolutionary manifesto of Pakistan People's Party in 1967 Faiz, like most of the leftists of the time, thought that it could be a step in the direction of the socialistic order that he and his colleagues were craving for. The period preceding the general elections of 1970 was full of hectic political activity. 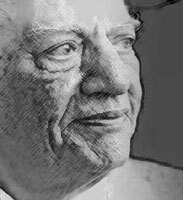 During the days of Ayub Khan's martial law, the pathos of the poetry Faiz wrote was characterised by a lack of civil liberties and his personal periodic stints in jail or exile. But the changed political atmosphere of the country after Bhutto came to power resulted in a positive impact on his poetry and his tone again became full of optimism. It was at this stage that he thought of writing some poems in Punjabi. Since the day Faiz appeared on India's literary scene, some people had been complaining that though Faiz wrote for the common man his diction was beyond the comprehension of the people he wrote for, barring of course poems like Bol keh lub azaad hain tairay or soach. Whenever Faiz was encountered with this question, he would concede that this had been a weakness in his Urdu poetry. In an introduction to Faiz's collection of poetry, Zindaan Naama, Major.Ishaq wrote: "Faiz's poetry has the spirit and emotions of a man of heart. Within it beats the heart of the nation but I don't know why the warmth of the sweat and the blood of a worker is not present in it in the required proportion. He remembers the roses and the jasmines with great affection but he does not describe the plight of the one who produces them with great toil and has full right to benefit from their beauty, fragrance and colours. His poetry has yet to come out of drawing rooms, schools and colleges and to spread to the streets, roads, fields and factories. He (Faiz) says that it could only be done through Punjabi." In a letter to Major Ishaq, Faiz's friend and old comrade Syed Sajjad Zaheer also pointed out this fact in these words: "I agree with you that he should now gather courage to jump in the direction where -- in addition to beauty, colour and fragrance of flowers -- there should also be the mixture of blood and sweat of a common man who actually makes and unmakes life. I fully agree with you but I do not want to push him in that direction. From the latest trend in his poems and ghazals I see a true democratic direction. I think he himself understands this point. The land of Punjab has centuries old tradition of producing democratic poetry in the verses of Baba Fareed, Bulleh Shah and Waris Shah... Why can't similar songs be sung again." Throughout his life Faiz was cognizant of the fact that whenever he would write true democratic poetry he would use Punjabi language which was his mother tongue and that of millions of Punjabis. He expressed same views while talking to Dr Ayub Mirza, author of Faiz's biography Hum Keh Thehray Ajnabi. When Khalid Hasan pointed out to Faiz about the use of an English word in the verse, the great poet appreciated it and told Khalid that a poet should not be subservient to language rather language should be subservient to him. Faiz had enormous love for Punjabi poets and poetry and was proud of the great heritage of Punjabi poetry. He was a great friend and admirer of Ustad Daman, the Punjabi poet who wrote for the common man. During the last few days of Faiz's life, both the poets spent quite some time together. Faiz used to say that Daman was the real poet of the masses. Daman died a few days after Faiz. Even in this poem it is quite evident that Faiz had not lost sight of the Fajar or the morning that he was longing for. And no doubt he was longing for this morning from the day he wrote Yeh woh sahar to nahin jis ki aarzoo lay kar. These very simple lines reflect the agony and suffering of the Punjabi woman in the most effective words possible. Faiz also wrote a poem on the floods that ravaged Punjab in 1973. The poem is written in the traditional Punjabi diction. In Heer Waris Shah, Heer addresses her father when she is being driven away by Kheras and so in every Punjabi folk song signifying marriage the girl complains to no one else but to her father, figuratively called babal in Punjabi. Faiz's poem (Mairi doli shauh darya) is also reminiscent of Ahmad Rahi's poems on the theme of partition. like a squeaking lark caught in a net. Then in a fit of frustration he concluded that "if You can't look after me then I should search for another God for myself." The poems quoted above show that Faiz was right when he said that he could write genuine democratic poetry only in Punjabi. And whatever little Punjabi poetry he has left is a tribute to the Punjabi peasants and workers and goes a long way in establishing the fact that Faiz was capable of using a language, understood best by the very people he wrote for.